Mine is simple, it was the special time with my family. This year it included 20 of us gathering at my Aunt S and Uncle M’s house. It was a wonderful time. 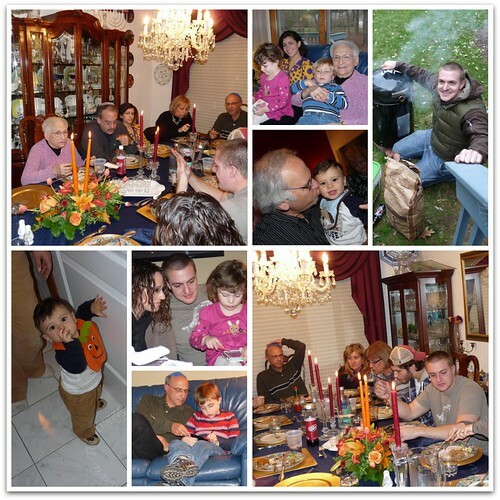 Here are just a few of the memories from the day spent with my wonderful family. Getting to spend a quite day at home resting. I spent last weekend with my family and opted out of going anywhere else for dinner. Being with Dad and the family and having Critter and family over. Not having to go out! YEAH! Getting together with family! Great shots. I missed not getting together with family since they live so far away, so we enjoyed an unconventional Thanksgiving celebration instead. Great photos: shows a lovely, close family! It was great to spend the day with friends! Nothing to report. We didn’t have dinner get together this year. Plans fell through and dh wasn’t home. Sad. But still so much to be thankful for. being with my hubby and son ! that was the best ever!!! This is going to sound silly but I was thankful for my Starbucks “grande” Pumpkin Spice Latte. I had a sick husband at home and the kids went to Nana’s with their Auntie. I took care of hubby and ran to the store to get a newspaper and coffee. I really missed having turkey and all the fixings!!! I might have to buy a turkey this week and cook one next weekend.